At the table at Espetus Churrascaria in San Mateo, CA. The other day, as I was driving north to San Francisco, I saw a billboard that made me do a double take. It was a giant image of skewered meat. It looked surprisingly like the barbecue served at the Santa Maria Elks Lodge, 300 miles to the south—a food that lingers indelibly in my mind (and, um, body; I ate nearly 300 pounds of meat while researching our story on the subject). The other day, as I was driving north to San Francisco, I saw a billboard that made me do a double take. It was a giant image of skewered meat. Normally I wouldn’t notice a shishkebab, even one 15 feet tall. 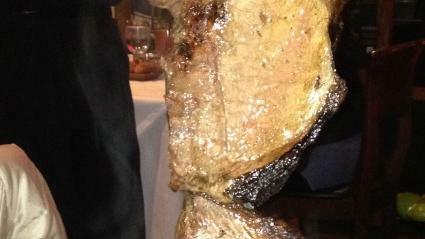 But this showed hunks of beef curved in a distinctive C shape on a massive steel rod. It looked surprisingly like the barbecue served at the Santa Maria Elks Lodge, 300 miles to the south—a food that lingers indelibly in my mind (and, um, body; I ate nearly 300 pounds of meat while researching our story on the subject). There, the barbecue style evolved from the way cowboys (vaqueros) cooked on the giant Spanish land grants that once covered much of California. I went to Espetus almost immediately. It was like dim sum, only with meat—skewer after mighty skewer of delicious beef. And lo and behold! There was top sirloin, the classic Santa Maria barbecue cut. In Brazil, it’s called alcatra. Just as at the Elks Lodge, it’s minimally seasoned and skewered, grilled over wood embers until burnished and crisp, but not charred. Two countries, thousands of miles apart. One delicious, distinctive way to grill top sirloin. Coincidence? I think not. But I’m itching to know how it hopscotched north. If you have thoughts about this, I’d love to hear them!